Webinars are increasingly important to the online marketplace who doesn’t have time to attend a conference, peel away from the office, or wants to learn on their own time. In fact, webinars, webcasts, and teleconferences can also be a long term asset as it’s viewed multiple times, and will continue to generate qualified leads. Yet, most webinar producers do it wrong, or they miss key steps in planning, or fail to follow up and ‘pursue’ attendees. A common mistakes? Not engaging with the distracted multi-tasking audience, and recognizing that webinars are now a two-way medium –even if chat features are not enabled in the platform. Those who seek to produce successful webinars should follow these “Ten P’s” and reduce risk and increase chances of success. 1) Philosophy: Most approach webinars realizing they are different than all other mediums. Despite being primarily one-way they have a social element as attendees will interact with each other in the provided chat features, or on tools like Twitter. Secondly, many webinar producers don’t offer helpful content to the audience, and instead treat it like a sales pitch. Lastly, speakers that are great on stage in the real world, may fall short and appear lackluster in an online faceless webinar. 2) Purpose: Many webinar producers fail to pick a succinct goal, in fact this is key as it will define how you measure success. Some objectives can include: Thought leadership, association, customer references, lead generation, sales material, accelerating the customer life cycle, or education. 3) Planning: There are many decisions and steps that need to happen in this crucial phase. From deciding if the event should be recorded in advance, or done live, when to schedule the event (taking into account a global audience and conference and travel sesaons) and then selecting the right platforms between Adobe, Microsoft, WebEx, and Go To Meeting. One biggest fail point is not having the right hardware and software (including compatible browsers) and waiting to the last-minute-scramble to get this done. The truly savvy producers will integrate the webinar with existing community and tie with direct marketing systems and then funnel leads to the CRM system. 4) Professionals: There are many talent considerations to make during this performance. Just as you would bring forth the best speakers at your customer conference, you should apply the same thinking here. Your internal team will include the following duties, but keep in mind, often one person will conduct multiple duties such as: Internal Stakeholder, Webinar Producer, Coordinator, Marketer, Community Manager, and Technical Support of both the platform, hardware, and software. The performance team will include any of the following: Speaker, panelists, emcees, and should have a backup speaker. 5) Programming of Content: Once a kickoff meeting has been set in place, the internal and performance team should discuss content. The producer should offer details about the event, goal, audience, and suggest topics. Decisions around this being a one-off event, or an ongoing series needs to occur, as well as the presentation style (keynote vs panel, or some type of hybird). The hosting company needs to clearly think through the risks of ‘pitching’ wares as it will have both negative and positive impacts. 6) Promotion: Most webinar producers don’t fully think this through, however successful webinar producers create a template of marketing content that can be used in multiple mediums, create a registration form that both collects opt-in leads as well as polls the audience for the actual event, applies an integrate marketing approach by alerting prospects via email, web, account teams and even advertising. In the most sophiticated examples the producer and marketer has developed a way to benefit by early engagement and word of mouth by polling the audience to submit questions and using social events features like Facebook and LinkedIn events. Tip: get your speakers to promote, for example, I always tweet out to my followers about my upcoming webinars. 7) Preparation and Practice: Like a real world performance, the speakers should both practice in advance by doing a dry run. While the entire set of content doesn’t need to be rehearsed specifics on the logistics, hardware, software, and connections tests need to be completed. Assume some aspect of the technical side will go wrong at the actual performance, so it’s key you reduce risk by having a rehearsal in advance. 8] Performance: This is it, we’re now at “Showtime!” One key mindset is to remember to engage with the crowd by sourcing questions. Savvy producers will have an emcee who can guide speakers or panelists that go astray, and also be the voice for the attendees who are asking questions in the chat room or even on Twitter. Savvy producers will poll the audience at the start of the event (or use data from the registration form) and also pose a post-performance poll, asking for satisfaction in near real time. 9) Pursuit: This is the most overlooked opportunity by producers. Rather than patting yourself on the back after the webinar, the greatest opportunity lies in “facilitating action after your call-to-action.” Do this by: sending a thank you to the attendees in email, and ask if they want to be contacted directly by your account and sales teams. Also, engage with those who were very engaged in the event, both in their explicit behaviors and duration of paying attention. Furthermore, publish the slides and recording, and make it easy for prospects to contact you to learn more. Then continue to funnel qualified leads to your sales team, showing in order of priority those that have requested to be contacted, and those that were highly engaged. 10) Post Mortem: Have an internal meeting to recap what was done well, and what needs to be improved. Develop a report for your primary stakeholder based upon your decided purpose, and send a thank you to the speakers. Lastly, congratulate yourself for producing a successful webinar! Most webinar teams are successful at planning and promotion, but often fall short at preparation and pursuit. Make your webinar outstanding by using these 10 phases as a high level checklist. I’ve a much more detailed worksheet for clients who hire me as a professional speaker for their webinars. It breaks down in detail each of these items into 60 specific items with insights and recommendations, which we can use as a working document in our planning, contact me for more information or learn about my speaking. It’s been three years since I’ve been back to China (see all my posts on Asia) to report on the local web scene but am now in Shanghai and have met with a handful of folks that are looking at social business within China. Don’t take this as a proper research report, but just sharing what I heard from speaking to a handful of professionals who are looking at the social web, culture, and business such as Sam Flemming, Bryce Whitwam, and hearing from Nicolas Zurstrassen of Nike present at the Social Media event where I was speaking. Caveat: Don’t take this as complete research, it’s just based on what I learned in a short period of time, you should connect with China experts who I listed out below. China’s online sphere already large and growing –with increased disposable income. The largest internet population in the world, 400mm of the 1.3 billion Chinese citizens are online, nearly one third and growing also with an increase in wealth. Google’s announcement of AdMob indicated they are tracking the top visited websites across the world, and wow, has the landscape changed. See this list of the visited websites around the globe, many of them are Chinese such as Baidu (#8), Tencent QQ (#9), and Sina (#11). Chinese internet marketing requires a specialized approach. The Chinese online community is vastly different than the West, There are different tools, websites, behaviors, and as a result different takes. I’ve outlined my findings from 3 years ago, if you want to see my previous field notes in this four part series. Brands and consumers go to Social Networking Sites (SNS) –not create their own. In the west, it’s common for brands to have their own online community that’s branded using a community platform. Yet, from what I heard, it’s more common for brands to join customers where they are in SNS sites like QQ, in order to reach consumers. They will often have to ‘pay to play’ the SNS sites to participate. Secondly, I met with CIC, who paid me to speak at their event, they are a brand monitoring company that focuses specifically on the online discussion in mainland China for brands. Facebook and Twitter are basically aren’t relevant: Both of these western owned sites are blocked by the firewall (bitly, seesmic and a few others blogs I regularly read), and I was unable to access them from my hotel. I was able to access them via my iPhone using the international data plan, and all Tweets were done by SMS. Those who really care about the social space have VPNs that can leap over the firewall. Consumer Brand Backlashes Occur Online: Like all markets, consumers are asserting themselves using mobile and online channels. At the Social Media Conference, it was discussed a few times about the HP issues with products and how netizens use the web to share their concerns (see video). Also, a holiday called consumer day, netizens will assert their voices over brands, and get educated on how to protect themselves. Was told that blackberries are still common for the business audience as they are often supplied by the employer, so you’ll need to know your mobile consumer behaviors before building platform specific apps for China. Know the Socialgraphics of your market: Understanding the nuances of the individual market is key. In fact, with China being a behemoth of online netizens, a dedicated approach is required. Just as you know the demographics and psyhographics of your online consumers, you’ll need to know how they use the social web, and that’s called socialgraphics. Your Facebook Strategy Need Not Apply: Don’t expect your North American strategy in social business and marketing to work in China, you need to find experts and hire experts that understand the nuances. You’ll need to know the specific internet memes here, how the discussions evolve, and how folks communicate with each other. Remember, each culture has their own social networking adoption (although Facebook continues to drive global dominance, however I don’t expect that to be the case for China) so you’ll need to rethink your strategy. Governance and Organizational Model Key for Social Marketing Success. Take a look at your social business organizational model and really ascertain which of the five models is best for your global business, in particular, the Coordinated, Dandelion, may be most effective, and in some cases Organic. I also was able to enjoy the city, and visit the massive 2010 Expo (bigger than the Beijing Olympics, estimated costs at over 40 billion dollars) and was amazed by the British, Dutch, and many other international pavilions. Shanghai has undergone incredible growth since I was here 10 years ago, and the growing skyline was impressive. I joined the Geeks on a Plane tour for the Shanghai events, including acceding the second tallest building in the world, the Shanghai World Financial Tower. The recently expanded subway was clean and well run, especially compared to the aging NYC subway and SF transit in my own area. Again, I don’t claim to be an expert in China and it’s netizens (the term used for the social web and community) so I encourage you to connect with Paul Denlinger, Yat Siu, Elliot Ng, Sam Flemming, Bryce Whitwam, Isaac Mao, Kaiser Kuo, Napoleon Biggs, Christine Lu, and Rebecca McKinnon all who I’ve spent time in person with and turn to them for information about China. Posting will be light for the next week, (I’ll make a brief stop by Hong Kong’s Web Wednesday) I’m taking my first vacation since I started my business as a partner at the Altimeter Group, 10 months ago. See you soon. Update: NPR quotes from this blog. If you’re a catalyst for change within your organization, this book is for you, you should buy several copies for your organization today. 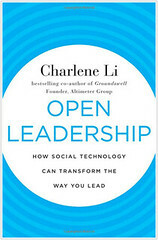 I’m proud to be part of the next generation of Groundswell, my business partner Charlene Li’s book ‘Open Leadership’ hits the shelves today. If you want your management team to accelerate their thinking for your social business programs, this book offers insights, examples of how other leaders have embraced these technologies, internal audits, checklists and even ROI formulas that the C-Suite demands. Like the prequel Groundswell, Open Leadership stems from solid research and yields real world use cases. For those of you that are managing existing social business programs you know how the biggest challenge is causing a culture change to happen from inside out. One of the key levers in your business program will be to obtain executive buy-in in order to bless organizational change –without it, you’re plane can truly never leave the runway without great risk. We work closely with many of the world’s social strategist’s a corporations, and know that the biggest challenge is a cultural change of letting go to gain more. This book, is a useful tome of knowledge that can accelerate learning within your executive suite. Use this book to quickly find examples of how other leaders around the globe are adoption social technologies in order to gain more. I’d also like to point out, from an internal point of view (having worked with her a few years now) that she truly lives and embodies the spirit of being open. She ‘let go’ of a lot of control of the company in order to make it a partnership, and is always open to our eccentric ideas. Aside from being a thought leader in the concept of Open Leadership, she lives it within her own company. I was previously involved in reviewing Groundswell before it was published and joined the Groundswell team, and am very proud to be back again working closely with Charlene here at Altimeter Group. Here’s the website with reviews, and details on how to order. Read the first chapter at no charge, it’s widely available on Slideshare. Engage in the conversation on Twitter at #OpenLeadership. Update: Thanks to you, it’s working, it’s now #10 on Amazon and #6 on Barnes & Noble as best sellers. Written by Jeremiah Owyang (Customer Strategy) and Ray Wang (Enterprise Strategy), Industry Analysts at the Altimeter Group. We’re tasked with a difficult job as industry analyst in one of the fastest emerging markets. Part of our role is to find new trends, identify their impact, and rate and rank who offers them. In the past, I did this for this list community platform marketing, and the Social Media Management System market (SSMS). Despite the influx of new entrants, even a new set of features is now emerging on the industry, and I’m here to identify it now. Soon your fridge, car, and house will tweet. (plants already do, and I ordered this “puppy tweets” collar so my dog can too). At work, your server, business applications, and eventually your powerpoints will emit signals as your colleagues make changes to it. The challenge is, all of this information is in different channels, and may not be aggregating to one location. To combat this deluge of information, we should expect a new feature to emerge that will aggregate all content into one locaiton and make sense of it. Usually when I start these lists, it starts with just a handful (there’s just 5 listed below) in the case of the community platform space, it grew to be over 100 vendors. market rumors that Facebook will develop a web based email client, that will likely integrate private emails with social signals. Feedera is a personal news aggregator that makes a sorted list of important tweets and other social signals like Digg, delicious and photos into your Feedera inbox. Gmail/Buzz: Gmail’s recent addition to their social networking feature “Buzz” launched with fanfare, then great concern about privacy. Despite the rough start, they allow users to connect with their friends and aggregate in other signals, such as flickr feed, tweets, and beyond. LinkedIn: Pulls in tweet stream, blog posts, Amazon reviews, and a variety of other data sources to generate signal. My 6th Sense: This application (primarily on an iPhone) offers a “digital intuition” by allowing users to aggregate data streams into one location. I’ve met the CEO and he showed me how it looks at your previous behavior in order to suggest content to you. Windows Live*: Windows Live (including hotmail) offers features that let you know “What’s new with your network”, while they don’t make it easy to add in social signals from other locations, this could be accomplished with partners like Gigya* or Janrain. Chatter by Salesforce*: Salesforce has made nods to launch an enterprise system that will “monitor everything that matters most to you in one spot.” Expect this system to be one of the first enterprise SIA systems and will pull in feeds from AppExchange data, external signals, and derive intelligence. Gist provides an inbox that ties in with Google Apps aiming them in the enterprise market. Socialcast. This lightweight tool allows any company to have an internal Facebook. They recently launched a ‘recommended’ feature on the left nav that can prioritize signal based on the gestures of your network. While they have integration with sharepoint, they’ve yet to offer ability to pipe in other streams. Update the management team has informed me they are working with a few large brands and are integrating signals from ERM and CRM, take for example this case study on Philips. Yammer. Yammer has the ability to offer enterprise microblogging features, as well as important RSS feeds. It doesn’t appear to have signal finding features, it’s currently just pulling in updates based on chronology. Looking at these vendors, some of them have 2-4 of the required features, but none have all four. We expect this space to evolve rapidly and will conduct continued analysis and rankings. Since we’re early, we’ll hold off on detailed analysis till the feature set standardizes. Remember, in the future, there’s no difference between email systems and social networks. Expect a new feature to emerge that combines both of these data types into a new interface. Expect a SIA for your personal life, and a separate one provided by your employer at work. If you know of others, please leave a comment below, and give justifications, we’ll link and credit you for your submission. *Altimeter discloses our client relationships whenever possible, as a result, we hope you’ll trust us more. Today, I’m pleased to see that the thinking –and technology, has emerged, where we’re finding a variety of companies that are integrating social technologies right into the corporate website, bringing the trusted discussions closer to the corporate site. In fact, I’m kicking off the Gilbane CMS conference in SF as the keynote, and will be sharing this deck live on stage. Although the highest state of nirvana (seamless integration) doesn’t yet exist, we should expect there to be very little difference between social technologies and corporate websites as content will assemble on the fly. I predict URLs won’t matter, as content will be dynamically assembled around the buyer and their context in a variety of devices. Sure, that’s far out thinking now, but that’s why we have several other stage gates that companies must first go through. In fact, use this presentation (loosely modeled after a post of the same topic) as a roadmap for brands, web strategists, and the vendors that serve them. Feel free to use these slides with attribution. Thanks to our head of Research, Christine Tran for her assistance. This is one of those important posts to forward to your marketing team, agency partners, and to Facebook themselves. While there’s been plenty of coverage about user privacy concerns, attention on Facebook’s changes on brands hasn’t been adequately covered, this analysis is intended to unravel what’s at stake –and what brands should do. I’ve spoken to a handful of brands and their representatives to learn what’s eating at them. Facebook has launched several new policies and features since the F8 Conference ‘Crusade of Colonization’ which has resulted in a large backlash from media around user privacy. It’s not clear if beyond the vocal media if users will leave the site in droves. Perhaps more importantly, Facebook launched “Facebook Community Pages” (read the official post) a feature that aggregates content from wikipedia and Facebook wall posts. Think of it as a cross between Wikipedia with user comments –sometimes unwittingly. These changes cause confusion for users, diminishing control for brands, and strains on the already torrid relationship between Facebook and brands. At Facebook, Innovation Means Asking For Forgiveness Later. This is a pattern. Facebook believes in their vision and launches innovative products (by innovation, I mean features others have not dared to do first) and then asks for forgiveness later. They often move faster than their community is ready, from going for .edu to public, exposing wall posts features, to Beacon, they push forward in the name of innovation. Aggregation is a Cheap and Effective Way of Creating New Content. It’s a brilliant model to repurpose existing content from other sites, as it’s low-cost for Facebook. However, the downside is that content aggregated from Facebook members wall pages may not have been intended to be created as public. Resulting in More Content Inventory for Advertising Opportunities. Facebook knows that in order to compete with massive Google, they need more content to be public. As a default, most features and content types are now being published in public, and you’re seeing why they’re aggregating existing Wikipedia content to drive up SEO and advertising revenue. They must be open to win the end game of monetization. Community Pages In the spirit of Wikipedia, Facebook launched a feature that aggregates content from Wikipedia and public wall posts from users This has created confusion among users as many iterations of a single brand may spread from ‘official’ Facebook pages to now community pages. (see example from Arbor Day) Additionally, this causes angst among brands who were told to invest. Facebook struggles with being public, so their strategy is to aggregate the public web into Facebook. Yet expect brands to revaluate spending time and money in Facebook as trust has been broken. Aggregation of Wall Comments Content from users public wall posts may be aggregated to Community Pages. However users may not: 1) Know the content is public, 2) It’s being aggregated out of context There are a few embarrassing examples of people’s content who are being aggregated such as “My Stupid Boss” as well as content being aggregated on Community Pages that are not contextually relevant. A search powerplay for Facebook. Facebook’s betting on more public content by aggregating existing content, which in the long run will influence brands to come to Facebook as SEO scores increase. Wikipedia Aggregation Wikipedia content about any topic (including that of a brand) is now being fed into Facebook Community Pages Less control for brands. Brands already struggle with updating and keeping accurate their Wikipedia pages, now the content will be spread to more locations. There appears to be a nod that Facebook will allow this content to someday be community edited. To be successful, brands must keep their Wikipedia pages fresh and accurate. Expect savvy brands to ignite their advocates to manage this as Wikipedians have a general disdain against brands. Logo Usage Facebook Community Pages aggregate in corporate logos onto these webpages, often without brand content. These real logos may cause confusion for users as they could mistake Community Pages to be the official page over Facebook pages. Legal department sending questions to the social strategist who’s not in control. Expect embarrassment and frustration for social strategists where the Community Pages have more followers than Facebook pages. Lack of Commenting Ability The Community Pages only aggregate content (some which is out of context) and do not allow for two way dialog in the form of comments Brands that have incorrect content on Community Pages, or brand detractors are not able to respond directly. This will cause frustration for brands as they try to respond into the aggregated wall post section from their own Facebook Page, causing continued confusion. User Privacy Woes There’s been much written (read the Q&A with a FB exec) about the privacy woes as more content is public, with complicated privacy toggles and controls. As users become frustrated (albeit, a small vocal amount), trust in Facebook will diminish, and brands will also lose interest in investing in Facebook. Although consumers say they care about privacy, but in most cases, don’t expect them to do anything about it until it impacts their personal lives. Communication With Brands These Facebook Community Pages (as I’m told) were not communicated in advance to brands, and they were generally caught off guard Partnerships are built off trust, and trust has been diminished by this recent move. I’m told (but can’t confirm) that Facebook has generally responded in email and sent a link to a web form and answered a Q&A (Which I’ve read, but will not publish) to brands. Further degradation in trust as communication is not met both ways, brands will seek other opportunities. Such as investing in community platforms on their own sites. Advertising Impacts More advertising inventory has been created by Facebook as Community Pages already have ads on them (once you’re logged in, see right nav). For brands that are not active in Facebook, they may see this as a “highjack” model in the recent criticisms of Squidoo, Get Satisfaction, and Wikipedia. They’ll be forced to participate as communities rally around their community pages. The savvy brands are already active in Facebook, and those that are hesitant will continue to approach with caution (now that trust has been broken). If Facebook continues with Community Pages, expect this increase in inventory to offer increased revenue streams. For the last few years, Facebook has told brands to invest in their relationship through advertising, Facebook Pages, and connecting with applications –yet recent moves erode the relationship. The Trend Continues: Power Shifts Away From Brands. Nothing new, more of the same: power continues to shift away from brands, read how some colleges are ‘freaking out’ by the lack of control. However what’s different is that in the past the ‘Groundswell’ as an unstoppable force from customers, brands weren’t expecting their power to be eroded from their media partner, Facebook. Brands Frustrated As Community Pages Outnumber Official Page. Facebook must become more open, and expect community pages to continue to be created. (see Tweet testimonial) I’m told that Facebook will migrate community pages to your official Facebook page, but more community pages are continuing to be created. Burning The Bridge To Revenue Island Will Take Considerable Repairs. Because these Community Pages were launched without the consent or preview from brands, skepticism has emerged on trust of these new features. If the long term strategy of Facebook is to generate revenues from brands (I know of a 7 figure deal in the works that could be re-evaluated) due to these changes. It’s important that Facebook go back to the core values that communication foster trust, which fosters relationships, which fosters partnerships, which fosters revenues moving. Work as a Collective. Nothing like using the power of community in order to influence a community that has power of you. Brands should connect to each other to both share intelligence, develop a common voice. Start with GasPedal’s Peer to Peer ‘Social Media Business Council‘ and the WOMMA trade organization, you’ll also find like-minded marketers in Marketing Profs, who may also offer an SMB perspective the others do not. By joining with your peers and approaching with a common voice, brands will be able to force their hand. You’ll have to work together. Monitor Your Brand on New Assets. If you already have a PR agency gleaning insights or have a listening platform in place, turn the listening devices towards Wikipedia and the newly minted community platforms. Setup alerting systems as changes on Wikipedia will now impact Facebook Community Pages. We’ve listed out the listening vendors in our latest report, Social Marketing Analytics. Spread Bets, Bring Community Closer To You. With power diminishing, brands shouldn’t place all their bets in just a few social networks. Instead, conduct socialgraphics to find out where your customers are, then invest in other networks. Furthermore, start analysis on building your own community off your corporate website for customers, advocates, and lifestyle communities. Give customers a choice to interact with others on your own properties rather than relegating to Facebook alone. Look at vendors like Mzinga, Awareness, Lithium, Kickapps, Telligent, Jive, Pluck, Liveworld, and beyond. Develop An Advocacy Program Now. I strongly insist that advocacy programs are key for today’s brand. They may have access to update Wikipedia pages, influence prospects, and become brand advocates when companies are unable to scale. Use this advocacy program checklist to get started now. See how vendors like Zuberance, Expo TV, and in some form, Bazaarvoice can spur forward advocates voices and aggregate. I’ve spent a few days sorting this out, and reading as much as I could, however if you’ve got more to add, please leave a comment with your observation, or suggestion for brands below. Update: I’d like to thank LaSandra Brill, a strategist at corporate who was a great source of information. I rely on her for her perspective, and I think you should too, follow her on Twitter. I like how Peter Friedman has made clear points on how Facebook must live with their world, both in comments and his latest post. Update May 27th: Roy Young, the head of Marketing Profs, has conducted a survey of users and marketers about Facebook’s changes in privacy, which are related to the community pages changes. Their findings indicate that trust has eroded in Facebook, and Marketers were more concerned over privacy than consumers. The most important findings is that marketers will ‘somewhat increase’ their investments in Facebook in next 3 months.